You may or may not have noticed, but the present is beginning to move so fast it’s starting to catch up with the future. One consequence of this warping of space-time is that the virtual world is beginning to merge with the real one in an increasingly tangible way. This new stage in the relationship between the two worlds we live in has got a name: augmented reality. Augmented reality applications such as Wikitude and the recently released Layar are available for Apple’s iPhone and Google’s Android. 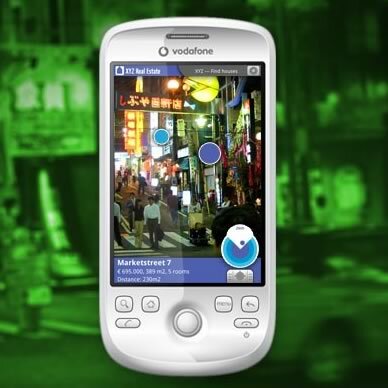 When you to point the camera-phone at a street, Layar, for example, will ‘augment’ the scene by bringing up links to relevant information from Wikipedia, Google, Yelp, Twitter, Flickr and different local services. The so-called ‘augmented reality browser’ is still in its early stages, so expect a lot more layers (equivalent to different websites) to superimpose over your reality in the future. All the technology for this is out there now. A facial recognition app to search through Facebook / Flickr photos has already been developed by Polar Rose. It makes tagging photos easy by recognising you or your friends and pulling up all the photos you appear in. An augmented reality browser such as Layar could integrate this, or it could be developed as a stand-alone application (as many AR apps already have been). Still, it’s going to happen, somehow, isn’t it? Been thinking about this kinda stuff for a while already. Especially while traveling it would come in very handy i would say. I can’t wait for it to happen! Good Afternoon!!! ideasexist.com is one of the best innovative websites of its kind. I take advantage of reading it every day. ideasexist.com rocks! Thank you so much for this great article, This was just the thing I needed today!